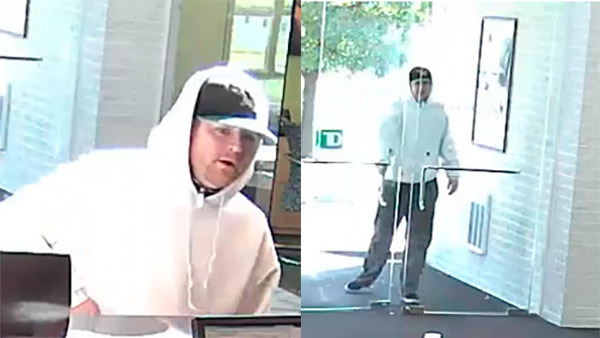 PHILADELPHIA (WPVI) -- Police are searching for a suspect who robbed two Philadelphia financial institutions in the past two weeks. The first robbery occurred around 2:15 p.m. on Wednesday, October 18, at the Freedom Credit Union along the 4900 block of Princeton Avenue. Police say the suspect entered the credit union and approached the counter. He presented a threatening demand note to a teller, then lifted his sweatshirt to display a gun tucked into his waistband. After obtaining an undisclosed amount of cash, the suspect fled on foot; he was last seen heading south on Tulip Street. The second robbery occurred around 12:15 p.m. Saturday at the TD Bank on the 3900 block of Woodhaven Road. Police say he approached a teller and presented a threatening demand note that referenced a gun. No weapon was seen during this robbery. After obtaining an undisclosed amount of cash, he fled the area on foot and was last seen heading north on Knights Road. The suspect is described as a white male in his late 20s to early 30s, approximately 6' tall and 180 pounds, medium build, with red hair and a red beard. On Saturday, he was wearing a white hooded sweatshirt and black Philadelphia Eagles cap. During the first robbery, he wore a similar sweatshirt and a black brimmed hat with ear flaps. The suspect is considered armed and dangerous. Anyone with information about these robberies is urged to call the FBI/PPD Violent Crimes Task Force at 215-418-4000. There is a reward for information leading to this suspect's capture; tipsters can remain anonymous.